The first days of the Summer here in the South always bring back memories of my youth spent in Provence and Les Grandes Vacances (Summer vacations) spent in the Alps. The scent of lavender, rosemary, thyme. Juicy cut cantaloupe and proscuito salad. Fresh sardines and trouts over a makeshift barbecue pit dug in the earth. Scrumptious fingerling potatoes cooked in the ashes afterwards. That smoky taste was unbelievable. Summers then and Summer now, wherever I find myself, are synonymous with the same scents and flavors. Lots and lots of peaches, cherries, apricots, plums, ice creams, sorbets, fresh and juicy pies. Days were filled with bike rides, hikes, swimming in the river, building tree house and fortresses. No toys necessary. Just friends. The anticipation of going back to the same summer vacation spot and see who was coming that year again. Even today, I have my brother to tell me who is still stopping by. Yes, thirty something years after their first falls and sometimes first kisses, now that children have become parents of their own, they find themselves continuing the traditions. It's good. It's actually awesome. The beauty of being in the present is that I can look up from my work table, cut open a peach and be transported right where I need to be. The look, feel and smell are all I need to create the photo story that calms or inspires me. I am easy. If anything, this past year has taught me to be in the moment. To let it unravel what I need to see. 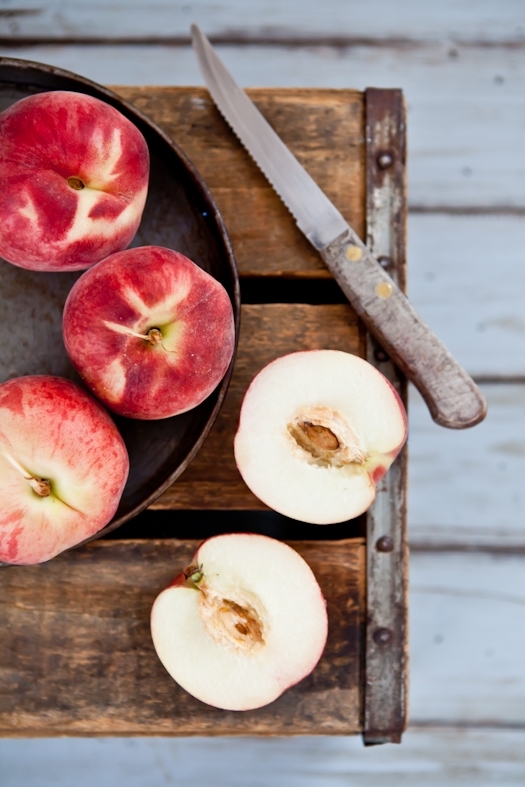 Stone fruits always make me reach for a complimentary fragrance. Lavender, rosemary, thyme, cumin. 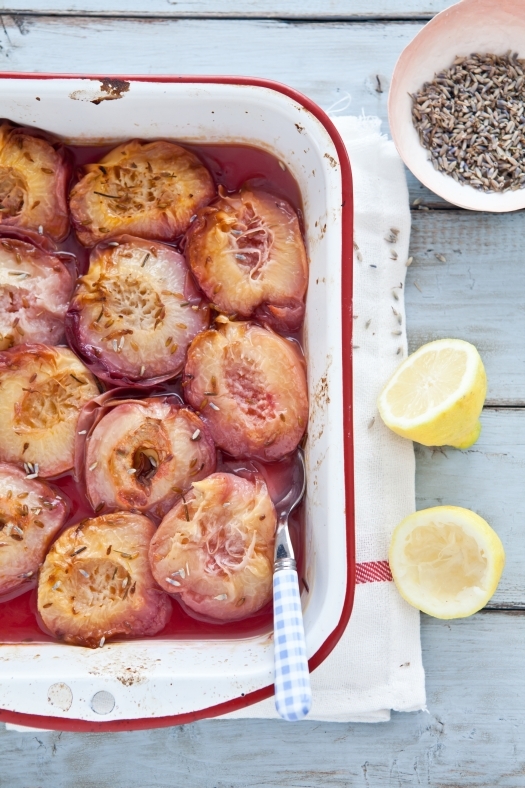 Grilled peaches and a few cumin seeds are just incredible together. It changes with my mood but as a Provencal, I think my instinct is to reach for the jar of lavender buds. It almost makes me hear the cicadas in the background. Almost... That and a glass of rose and well, I am just about set! This ice cream is really the best of all worlds right now. 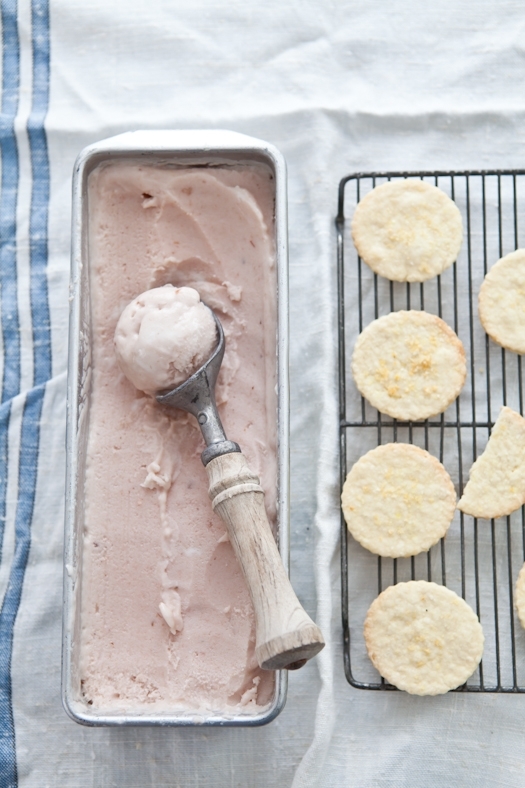 Juicy peaches, lavender, plenty of creamy goodness. I served it with easy lemon zested shortbread cookies topped with a little sprinkle of lemon salt I brought back from Portland last year. The contrast was perfect. A nice balance of flavors, sweet, salty and creamy. I wish I had unlimited supply to lavender..
Looks so beautiful to eat! :) Gorgeous photos! I really love your placement of everything. Wow, all of this looks wonderful! I wish I could get my hand on one of those cookies. I am currently counting down the days to my own summer vacances in Provence. I seriously can't wait and this post has just made me even more excited! you have out done yourself with this...so gorgeous. Those peaches just jump off the screen and are so luscious. I love shortbread and am thrilled to see a GF version. Thanks! This ice cream looks so good! I have been having a love affair with any ripe stone fruit and recently roasted some peaches too. The cookies also look wonderful--and so simple! I have been looking for a good, gluten free shortbread--thank you! Amazing! I can't wait until we get some ripe peaches around here. My lavender is just now blooming. I'm going to have a real big harvest and I'm so excited to have another use. lol I love the smell the taste everything about it. 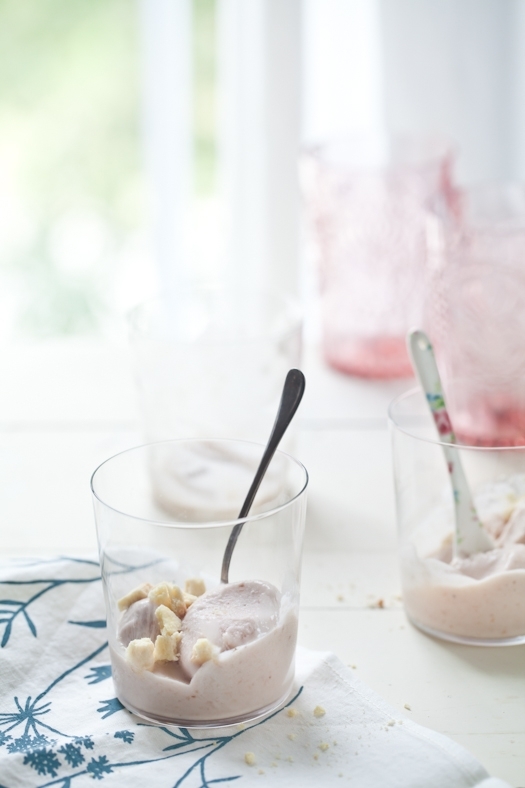 I love the softness of the images and how wonderfully refreshing the ice cream sounds. Great idea to garnish with the shortbread pieces! I will try that for sure! I am obsessed with lavender. It has become my all time favorite scent. I stand in my garden just to soak in the fragrance. Of course, the idea of lavender ice cream appeals to me. Thank you! I just visited the most beautiful Lavender farm in the Okanagan Valley and came home with their lavender oil to replicate the incredible ice cream I tasted there. And have just got the photos up ready to write, when this popped in my mail box... all yesterday. I was so excited about the ice cream that cookies, or fruit, didn't cross my mind. The ice cream is DEADLY delicious. I am addicted - but, mine doesn't have a lavender hue... just eggy yellow fatty floral goodness. LOVE your scoop. Is it vintage? I hope you will share your source. Thank you so much for the recipes. I once had lavender ice cream in a gorgeous restaurant - you have reminded me - I must try to make it. In fact I would enjoy everything here! Oh this sounds beautiful! I have a pot of lavender sugar I haven't used much of - do you reckon it's possible to make a simple syrup from it to substitute a bit of the honey? If yes, how much would you recommend substituting? Thanks so much Helene!! The ice cream looks great. Jaime: equal amounts since they are both invert sugars. Randi" Actually, it would have been better to ask permission to copy/paste and repost my picture. Thanks! 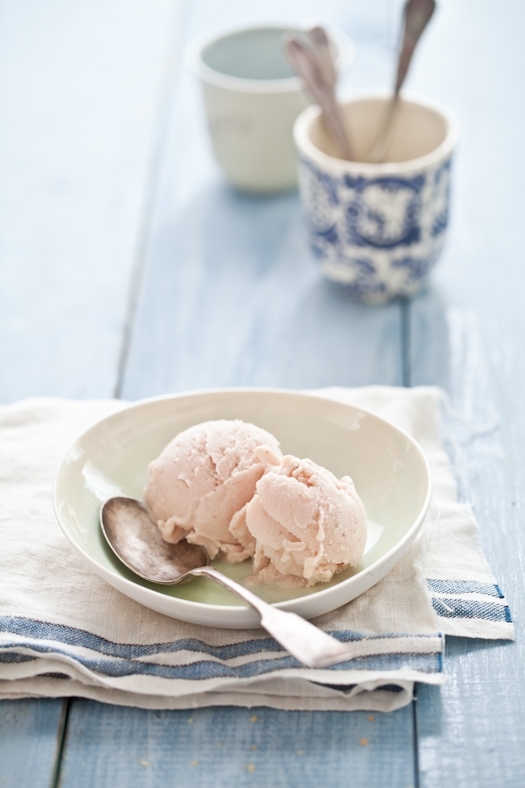 Just whipped up a batch of this peach ice cream and can't wait til this evening to try it out. I leapt from this post to your ginger ice cream which I made too. 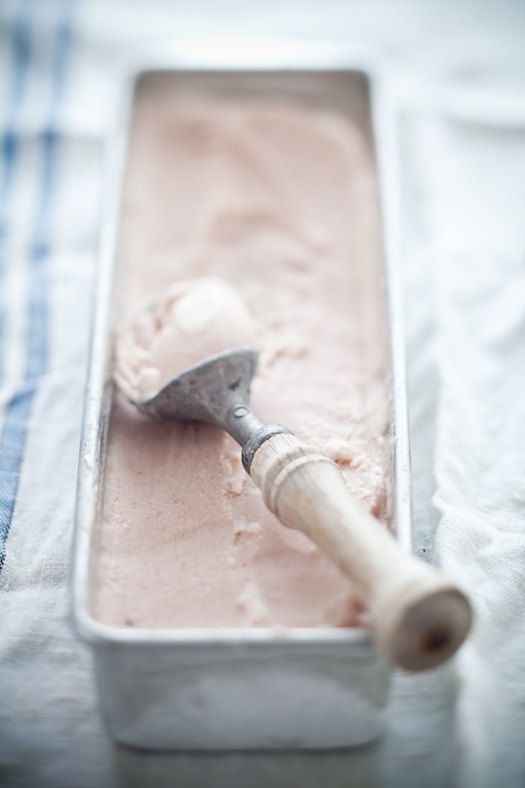 I note that you have a good many ice cream recipes that ditch the eggs and use a very simple base. I can't think why so many recipes need x number of egg yolks when your base here works a treat with just milk and cream. I am always worried about raw egg especially when serving older people, kids etc. I can't wait for you to post some more intriguing ice cream combos! Here's to summer big time - I am in the Med, and all I dream of eating is ices now it's in the late '30s! Thanks for your amazing recipes Helene! Your ice cream looks amazing...much better than what I normally have from the store. 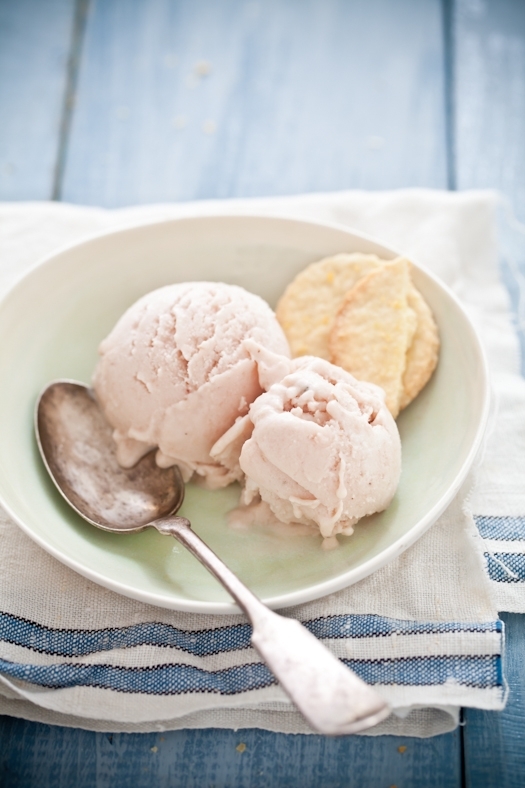 I did make some peach ice cream this weekend but it did not look anything like yours. Thanks for sharing. My dad is OBSESSED with peaches so this recipe is a must-try! This looks so stinking good! Thanks! I was wondering how many servings your ice cream recipe makes? I need enough for about 15 people. Rachel: I would make 2 to 3 batches to serves 15 people depending on how hungry they are and how much of a sweet tooth they have.